The thing is in flawless shape, but I have no use for it. It will come in the original box along with all included hardware necessary for mounting. Gordo, I had a thought in the back of my head that this wouldn't fit, but I didn't listen to it. I read the bumper swap thread a long time ago and vaguely recalled what front end components could be swapped, but I ignored my intuition and bought this thing anyway. Oh well. If no one buys it, I have it if I ever want to use it. With all the RHD cars coming into N. America, I'm sure you can get your money out of it. Especially because WB put pictures on the box of what front end it fits. Same with you Lofty, and probably more because I sold it to you cheap due to it not fitting the MX. 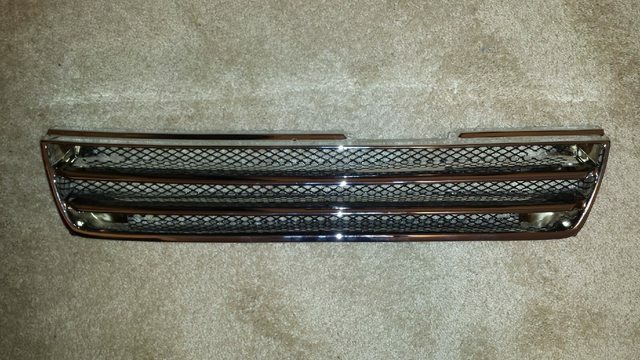 There is a couple of those WB Sport grills on YJ right now, and they are going for what a front clip used to cost. 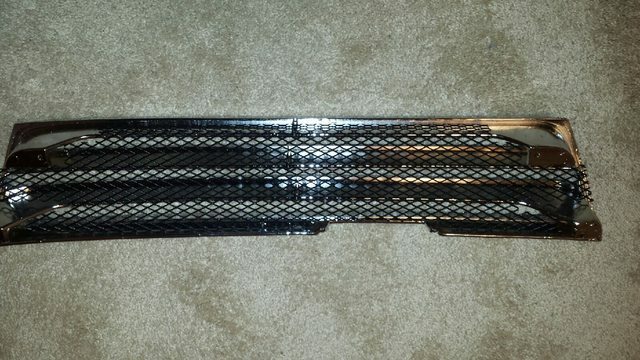 Just like the OEM option rear window louver style sun shade inserts I have, there is one in Japan right now for $800 frigging bucks. 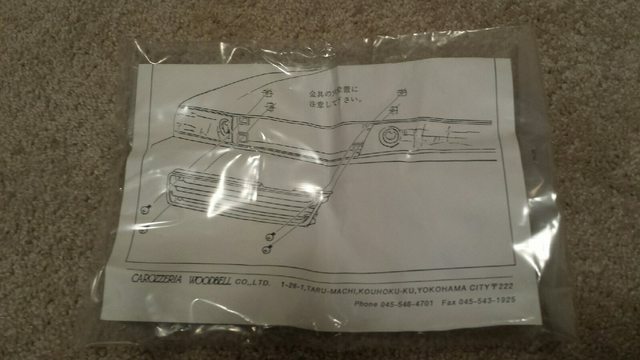 Guess it's time I unwrap my car from it's cocoon, and figure out which of my inserts fits the N American rear window, and get rid of the other one. 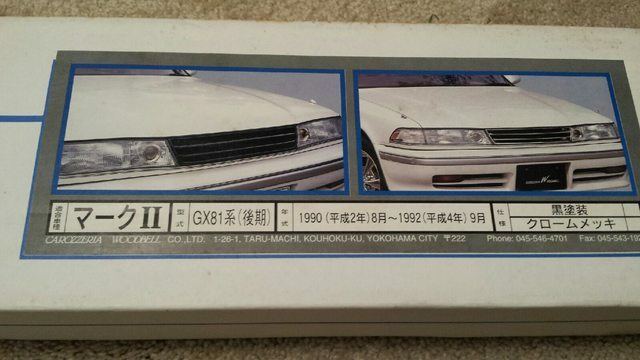 You know there were about 4-6 different front ends in Japan for the X8 Cresta/Chaser. I actually had 2 different 'glass ones, I'm wondering who got the other, Mo, or Jason ? If I remember correctly they were too short for the US X8. Should compare lengths with BoristheCat, at least his is new, in a box with pictures. Yeah Gordo, that's the same one that I have. 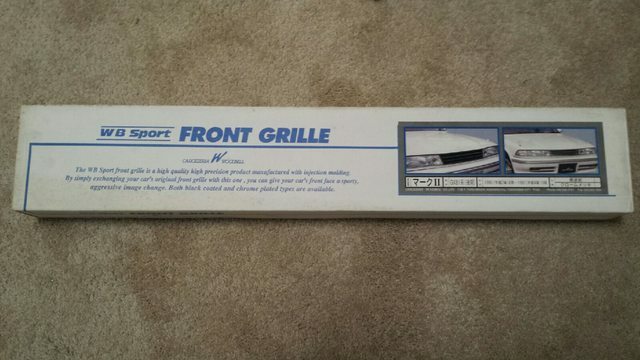 This WB Sport grill has a good inch and a half to two inch gap on either side of the headlights. It's significantly smaller than the stock X8 grill. An overall length measurement would be more helpful. Pretty sure that would fit Brian's new car, or any with that style head lamps.